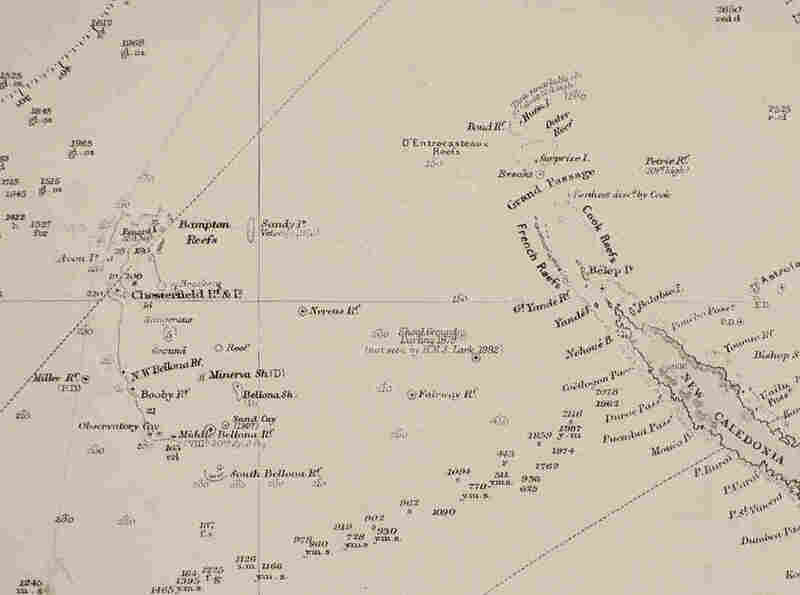 Pacific Island, Bigger Than Manhattan, Vanishes : Krulwich Wonders... Sandy Island, located in the Pacific Ocean off the coast of Australia, occupies about about 45 square miles of the Coral Sea. It was documented in 1772 and appeared on a 1908 admiralty chart and in Google Maps. The problem is, Sandy Island never existed. You can see it on this Google Map — a little spit of land, sitting between Australia (on the left) and French-governed New Caledonia (on the right). It's called "Sandy Island." In the Times Atlas of the World it's called "Sable Island." On both maps it's a conspicuous land mass, roughly 15 miles long from north to south, three miles across. Altogether, that's about 45 square miles — about one and a half times the size of Manhattan. It's on older maps, too, like this admiralty chart published in 1908 — follow the vertical line (longitude) down, and look to the left. It's the biggest dry spot in the neighborhood. 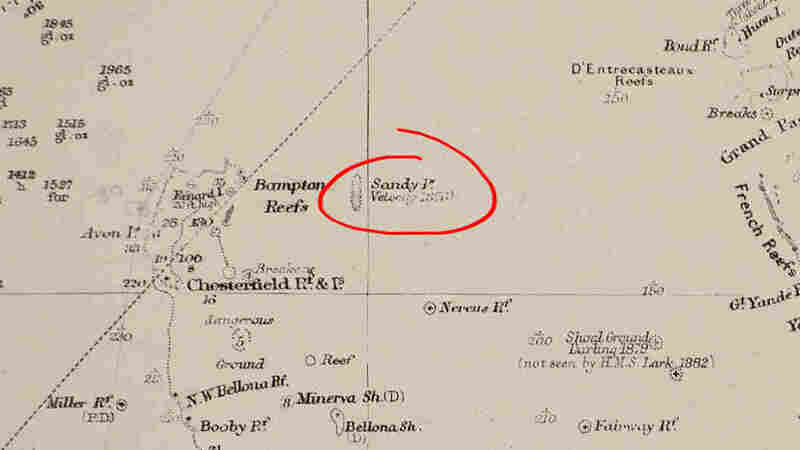 Sandy Island has been on navigation charts for centuries. Blogger Frank Jacobs of Strange Maps found a reference from British explorer Captain James Cook, who passed close in 1772. He cites French navigator Joseph de Bruni d'Entrecasteaux as the possible discoverer in 1792. British sailors on the ship Velocity saw it again in 1876, according to Auckland Museum pictorial librarian Shaun Higgins. But they didn't step on it, they just noted its approximate position. And then, after all this time on so many maps, Australian scientists recently made what is called an "Un-Discovery:" Late last year, they announced Sandy Island doesn't exist. What's more, it never existed. Ever. It didn't sink. This is not a global warming-rising ocean story. This is just a fantasy that never got corrected — and stayed uncorrected, oddly, into the space age. You'd think that with mapping satellites, spy satellites, military satellites, navies all over the world wanting to know what not to bump into, the world would have noticed if 45 square miles of rock that was supposed to be there, wasn't. Someone would have asked, "Why can't we see it?" Ham Radio Enthusiasts Ask, "Where Is It?" Actually, someone did. In 2000, a bunch of ham radio enthusiasts were looking for the most remote place possible to transmit a radio message. This is something ham radio folks do. They compete to send signals from faraway places. A group in Australia found a bunch of reefs, rocks and islets called the Chesterfield Islands in the Coral Sea, and thought they might go there to compete. 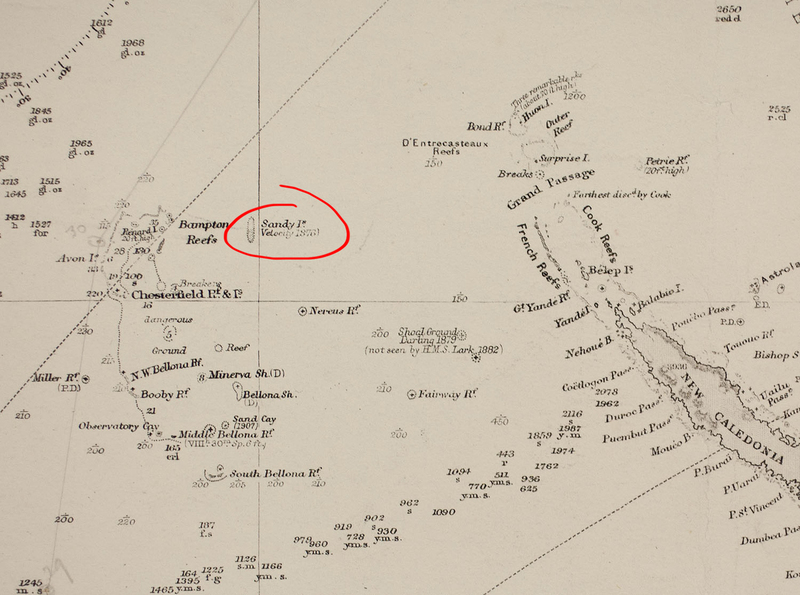 But a few maps included a much bigger 24-square-mile mass (that would be Sandy Island) very close by. 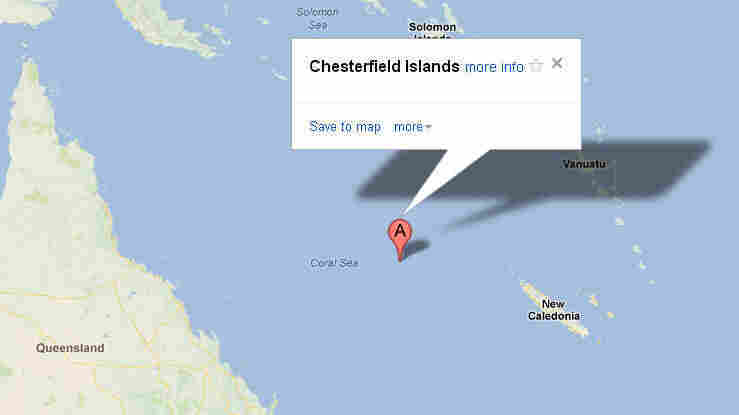 The presence of Sandy Island made the Chesterfields Not Remote Enough — and would have spoiled the trip. But these folks, said a report written at the time by ham enthusiast Tim Totten, "are a determined bunch, and they are not always willing to take National Geographic maps or other obstacles at face value." It's not clear if they actually sailed to the spot in the ocean where the island was supposed to be, but they definitely searched, and Totten reported the "group concluded that this 6-km long claimed island simply does not exist." However, their "Hey, it's missing!" report made little impression in cartographic circles. Ham enthusiasts and mapmakers apparently don't talk much. It took another 12 years for the second team of researchers — this time geologists — to come looking. They were puzzled. A map of the sea floor showed very deep water where Sandy Island was supposed to be. The geologists wondered how a land mass could appear to be "floating" on the ocean surface with no substructure, no mountain underneath. It didn't seem possible. So in 2012, the research vesssel Southern Surveyor, approached, cautiously, arriving at the exact spot indicated on the map, 19°15' S 159°55' E, and found only ocean. No land. 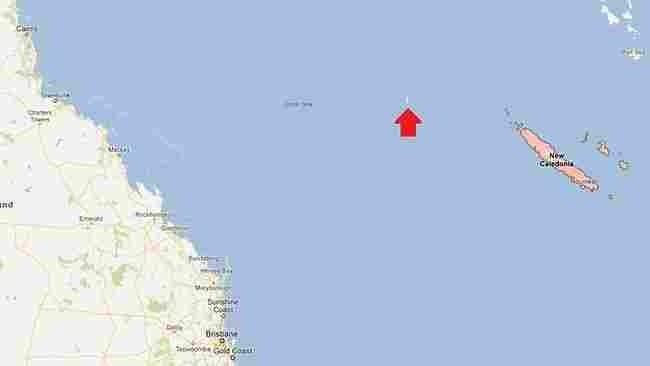 "It's on Google Earth and other maps," Dr. Maria Seton of the University of Sydney told the BBC in 2012. "We're really puzzled. It's quite bizarre." "It's hard to see how nobody — or, more precisely, no satellite — was able to spot this anomaly before," writes blogger Frank Jacobs. "And it's incredible that it took a good, old fashioned look-see to discover Sandy Island's non-existence." A New Age Of Un-Discovery? The question is, How many more phantom islands are sitting on maps, waiting to be Un-Discovered? 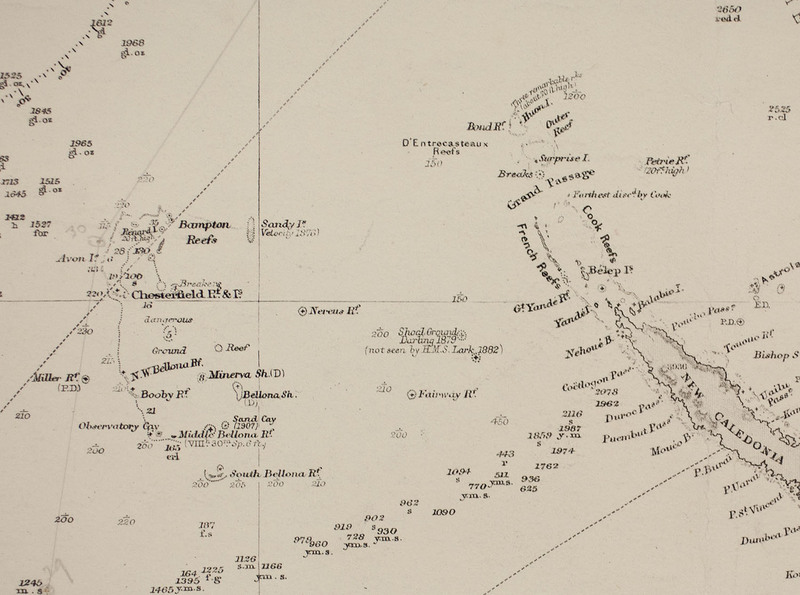 Right now, all over the world, mapmakers are removing Sandy Island from their maps. It's no longer on Google. It will not appear in the next National Geographic map. Frank Jacobs has written about Bermeja, a Mexican island that has been on maps of the Yucatan since the 16th century. It's disappeared. (Did it sink?) There's New Moore Island, off India in the Bay of Bengal. It rose out of the water in 1970; By 2010, it was covered again. Sannikov Land, in the arctic sea off Siberia, first sighted by an explorer in 1811, then "seen" again in 1886 and 1893, was finally visited by the Soviet ice-breaker Sadko. They found...nothing. Some of these islands were once actually there, some not. We may be at the dawn of a new cartographical era, where mapmakers rush about un-discovering what we once discovered. With global warming and rising sea levels, un-discovery may become a new, profitable business. Columbus had his day. Now it's time for his opposite. Who wants to be an Un-Columbus?